I custom mixed for each nail. As a final note...I am pretty sure my kids ingested some of these beads as I had to make lunch after this...and yeah, I was picking micro beads out of their eggs. A little micro bead never killed anyone, right? 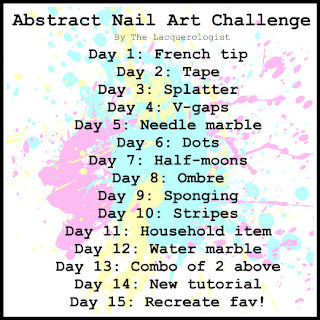 Look for Day 9 from this challenge on Sunday and please check out what the other lovely ladies came up with! What a fun take on this!!! This is totally awesome!! I love the black and blue together! It looks like 3D camo! I'm going to have to try this!! This is a really fun take on the ombre! Looks awesome! Love, love, LOVE!!! This is amazing! 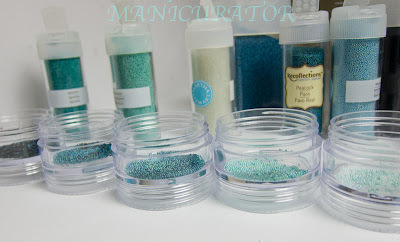 I stil have yet to try a micro bead mani and you are making me want to even more! Oh yeah Victoria. Your right, this one with those clumpy black beads is a disaster!! Lol. Haha - I love the comment about your kids ingesting the beads. I had to take mine off when I tried a microbead mani so my poor Mom didn't find beads in her birthday cake! Lol. I love this idea :) It's very cute and I think it turned out perfect!